Brighton and Hove News » Here’s a Brighton gig not to be sniffed at! Brighton is such a fab place for gigs as we have many decent venues that put on music to suit all tastes, whether your preference be acoustic, dance, metal, indie, country or punk, there will certainly be something that will crop up for you within a short space of time. 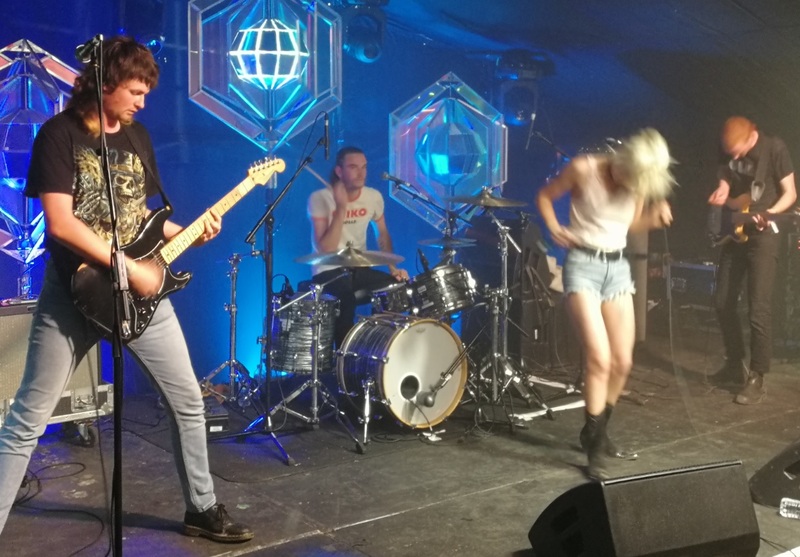 If you enjoy music that is entertainingly loud, fast, brash and full of aggression and dare I say it seduction, then you really need to see the wonderful Amyl & The Sniffers. Back in May 2018, this Australian outfit took The Great Escape new music festival in Brighton by storm. They were one of the top highlights from those heady three days of new music and ever since then I keep hearing their name banded about and indeed they are highly tipped to be one of the very best acts to breakthrough in 2019 according to the likes of the NME et al. Thankfully, they have sensibly decided to return to these shores for a headlining tour in April and they are booked to appear at The Haunt in Pool Valley, Brighton on Sunday 7th April. Judging by the way things are going for this band, I would suggest grabbing your tickets quickly, as I reckon that they will all sell our pretty fast! Tickets can be purchased from 10am on Friday 25th January from HERE. “We stay in the Beach House for another Australian outfit, who are a million miles away from the previous act, not in terms of where they were born, but on the musical front. Amyl And The Sniffers are Amy Taylor (vocals), Dec Martens (guitar), Gus Romer (bass) and Bryce Wilson (drums) and they are Australia’s answer to Wendy O. Williams New York City’s punk/metal Plasmatics”. “They are loud, brash, full of aggression, fast, noisy, have attitude and certainly know how to entertain and get their audience right behind them”. “I am thankful that I have managed to catch their show, as I tried to see them on the previous night at the Prince Albert, but I have to say that I have never seen such a long queue to get into a gig there before and it was plainly obvious that those outside had absolutely no chance of getting in, myself included”. “There’s nothing polished about this lot. Just over a year ago, they all came home to their shared residence one day and spontaneously wrote and recorded their first EP titled ‘Giddy Up’. It took them just four hours to get the whole thing done, after which they released it for free on Bandcamp”. “Humble beginnings indeed, however the Amyl gang will always remember Tuesday 23rd January 2018, as they played a gig to many thousands of people at the Coopers Stadium aka Hindmarsh Stadium in Adelaide, (which hosted seven games of men’s football for the 2000 Olympic Games) as they were opening for none other than The Foo Fighters. Therefore, Amy and the guys sure know how to captivate an audience and the Brighton punters were enthralled by their set. They were tremendous and I hope that they come back very soon. One of the best TGE gigs”. For more information on Amyl & The Sniffers visit their Facebook page HERE.